OVERLAND PARK, Kansas - January 19, 2018 - Bushnell, the industry leader in high-performance sport optics, will launch more than a dozen new optics at the 2018 SHOT Show, January 23 to 26 at the Sands Expo Center in Las Vegas, Nevada. 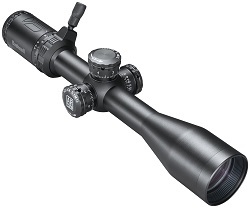 The new Bushnell lineup includes a new Tac Optics line, as well as additions to the popular AR Optics and Elite Tactical riflescopes. Tac Optics is Bushnell’s newest family of tactical riflescopes and red dots. Tac Optics riflescopes are available in four configurations, with multiple reticle options and 30mm and 1-inch diameter tubes. Tac Optics riflescopes were designed to improve the performance of every shooter, from novice to professional, and can adapt to any environment and application. The new Tac Optics red dots feature three models. The Mini Cannon gives users four reticle options at the push of a button and delivers industry-leading battery life (more than 30,000 hours). The Lil P(rism) is one of the industry’s smallest prism sights, and the BDC reticle is ideal for carbines. The Big D(ot) is anything but small with a massive 37mm objective and FOV unrivaled in the red dot market. All three optics provide some of the brightest dots available, with market-leading battery life. Bushell’s AR Optics riflescopes are designed specifically for the AR platform. New models are available for nearly every popular AR caliber, including 22 LR, .223/5.56, .308, 300 Blackout and even 6.5 Creedmoor and new .224 Valkyrie. Each scope has a throwdown power change lever with two different heights, making these scopes as customizable as the rifles they share a name with. In the competition scope game, Bushnell’s Elite Tactical line has built a reputation for extreme performance that goes far beyond the price tag. Bushnell’s DMR line of riflescopes are trusted by military, law enforcement and PRS champions - shooters who know every shot counts. The new DMR II Pro Riflescope combines that performance with ED Prime Glass. The best glass Bushnell offers, ED Prime Glass brings out rich color and the finest details, even (and especially) in low light. The DMR II Pro has all the other great features of its predecessor, and remains the only choice when precision is a requirement. Bushnell Elite Tactical red dot also gets an upgrade. The CQTS II Red Dot is built with the quality, durability and performance that comes with the name. The Close Quarters Tactical Sight is a 30mm tube red dot and features four reticles, which can be switched with the push of a button. The 30mm tube red dot comes with a battery that can last 50,000 hours. Attendees of the 2018 SHOT Show in Las Vegas can see the new at the Bushnell Booth #14551.